The experts of the United States (US) were working with the Sri Lankan government to help it become a financial services hub, improve environment for foreign investments and to seek solutions to other difficult issues like budget deficit, a high-level US official yesterday said. 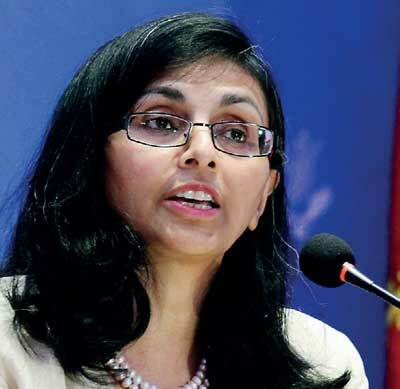 Addressing an audience consisting of top-level Lankan businessmen, the visiting Assistant Secretary of State for South and Central Asian Affairs, Nisha Biswal said the support of these experts comes as a result of the US-Sri Lanka Trade and Investment Framework Action Plan. Commenting further, she said developing new markets, which could harness Sri Lanka’s potential as a regional maritime and services hub on par with Dubai and or Singapore, was important. “After all, half of the world’s merchant fleet passes two traits of the Indian Ocean from West to East and East to West across Sri Lanka, which is strategically located in the middle of the Indian Ocean,” she said. In fact, the US government has been helping the officials of the Colombo Port by providing operational and security training through container training initiative and megaports projects and have taken them to the US to share expertise with the officials of US companies in Louisiana and Maryland. She said achieving the status of maritime hub requires a proper legal regulatory framework and there are massive obstacles currently such as high tariffs exceeding 1,100 percent sometimes. Biswal noted that the environment for investments is fairly open in Sri Lanka now but subjected to often long and non-transparent procedures. “Another greater obstacle for foreign investment in the global arena is the culture of corruption, which still lingers somewhat today. It is fortunate to note that President Maithripala Sirisena had declared that his government’s prime duty is to root out corruption from the country,” she said. Acknowledging the potential of the country and business-friendly political environment created by the new government, she said that this was Sri Lanka’s moment and it can be a dynamic power in the Indo-Pacific region. “Former Singapore Premier Lee Kuan Yew once said he wanted to turn Singapore into a Sri Lanka. Conflicts reversed the fortunes for Sri Lanka but now it’s time to make the country the next Singapore. We, the US, will be there as your friend and partner, investing in Sri Lanka’s future success. Sri Lanka’s prosperity and security are intertwined with ours,” she said. Biswal said nearly US $ 3 billion worth of products are purchased by the US from Sri Lanka annually and the US is the best customers of Sri Lanka. “We will help in the endeavour of fostering economic stability in Sri Lanka. We can and do and will do more,” she said and noted that Sri Lanka could benefit immensely from the Indo-Pacific Maritime cooperation. Meanwhile, she lauded the government for joining the Open Government Partnership and passing the Right to Information Bill in parliament and said these were positive signals of promoting transparency, which is one of the much-needed ingredients to promote investments. She highlighted that so many countries and communities in the world were stumbling towards negative directions but Sri Lanka is coming together on a positive trajectory and is looking to achieve its potential. “That is why this is my sixth trip to Sri Lanka in 20 months. Sri Lanka proved that reconciliation, accountability, good governance and freedom of expression go parallel by economic progress. It is showing the world how political growth and economic reforms go hand in hand. It is becoming a global example of how a country with a post-conflict achieves lasting peace and thrives in prosperity,” she said.